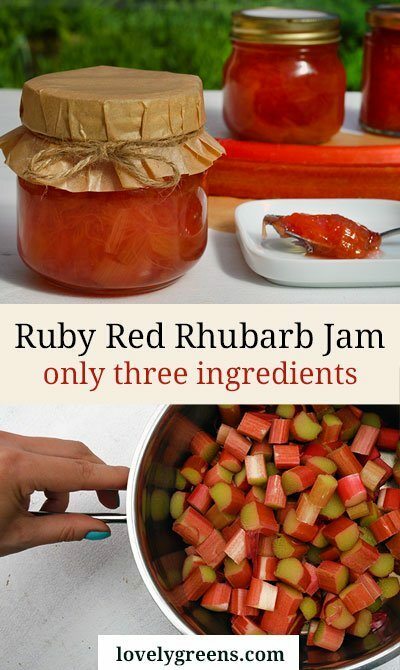 Make sweet soft-set rhubarb jam with tender red rhubarb stems. Just three ingredients and very simple instructions. Spring rhubarb is the earliest homegrown treat but it only lasts a short while. After spring you’ll need to wait another year to taste it again so while the stems are red you should set about making jam. 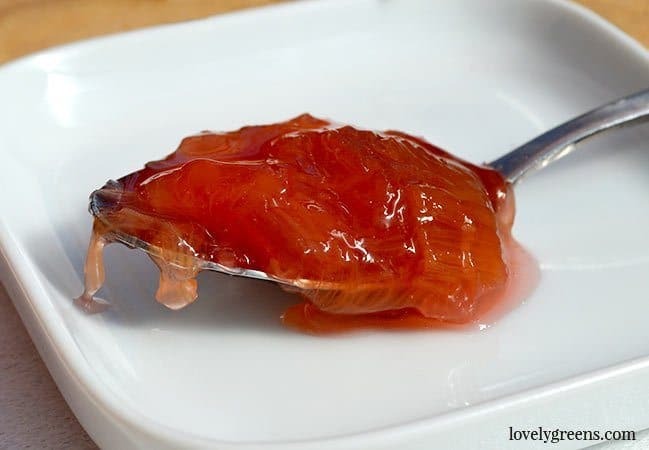 Especially sweet soft-set jam that can be spooned over pancakes, desserts, ice cream, and buttered bread. This recipe will make four small jars so if you’d like more, double (or triple!) the amounts. There’s a lot to be said for early spring rhubarb. It’s more tender, redder, and has a more delicate flavour than summer rhubarb. This is even more the case if you grow or buy ‘Forced’ rhubarb. It can set you back up to £1 per stem but it’s very easy to grow yourself — it’s just rhubarb that’s been grown in the dark. 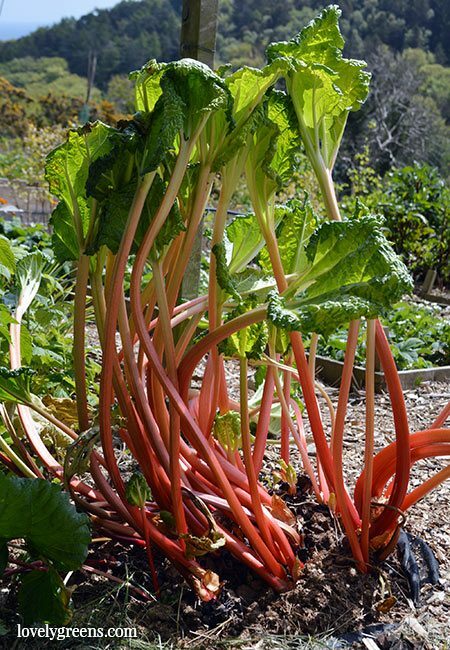 If you have a rhubarb plant in your garden, place an upended pot or bin over the plant in winter. Leave it there until early spring and then harvest the sweet red stalks as early as February. Take the covering off completely in April and don’t force the same plant two years in a row. 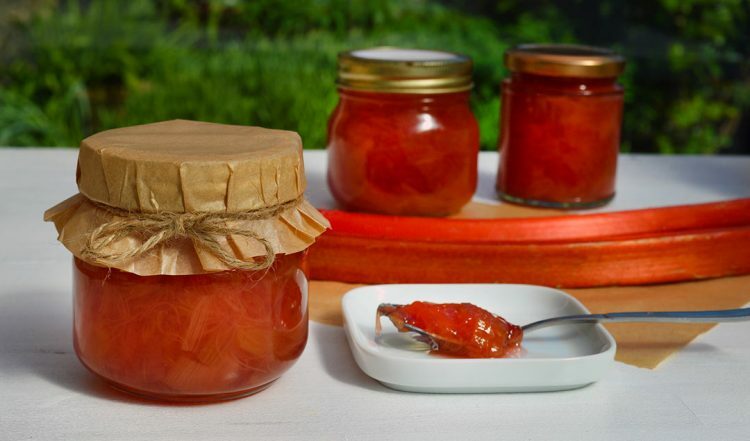 This soft-set preserve makes 3-4 120g jars (2-3 340g jars). I prefer using smaller jars so that the jam is used up more quickly! Make sure to sterlize your jars, lids, and rings before you begin. You can run them through the dishwasher or wash them with hot soapy water. If choosing the latter, make sure to rinse them well and dry with a clean tea towel. 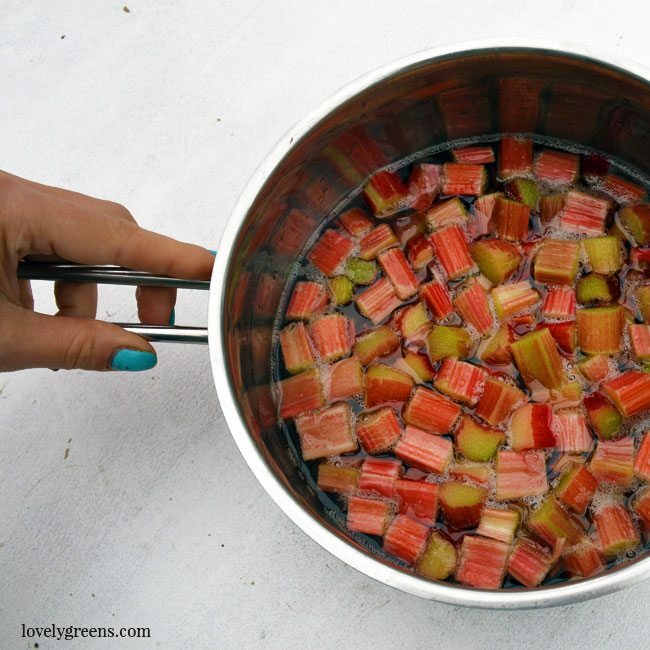 Rinse the rhubarb stems in cool water and then trim the leaves and bottom of the stem. Slice the stems into 1/2″ pieces and place them in a large saucepan. 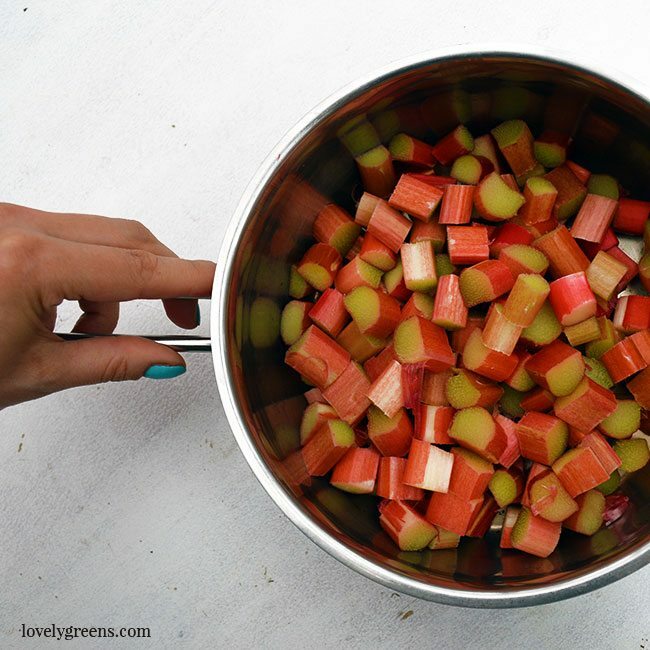 Pour the sugar over the rhubarb, stir to cover all the pieces and then let sit overnight. You can leave the fruit on the counter but make sure to cover it with the pan lid. Overnight the sugar will have drawn the juices out of the rhubarb and the pieces will look slightly shriveled. Pulling the juice out of the ‘fruit’ will help keep the pieces from falling apart completely in the jam making process. Now place the pan on your hob and bring to a boil. Add the lemon juice and stir carefully for about five minutes, trying not to break up the pieces. Though most people don’t water-bath jams and jellies in the UK, it’s better to follow the lead of our American cousins. Water bath canning both sterilizes and preserves high-acid food like jams, jellies, pickles and chutneys. You know that your preserves won’t be contaminated and go off in the jars. Spoon or funnel the jam into clean, sterilised jars and screw the lids on fully but not super tight. This is called finger tight. Next, lower the jars into a large pot of boiling water using a jar lifter. It’s best to have a rack or folded up tea towel at the bottom of the pan so that the jars don’t come into direct contact with the main heat source. Make sure the water covers the jars by about an inch and that there’s at least half an inch space between the jars and the pan and between the jars themselves. Wait for the water to come back to a boil. After it has, set a timer for 10 minutes. At the end, take the jars back out and set them on a towel on the kitchen counter. Leave them for at least 12 hours to cool down. With metal lids you’ll hear pops as the lids seal. Tattler lids don’t make this sound so don’t worry if you don’t hear anything. When cooled, store in a cool cupboard but refrigerate after opening. This jam has a shelf-life of 12 months. If you’ve not heard of these before, let me introduce you. 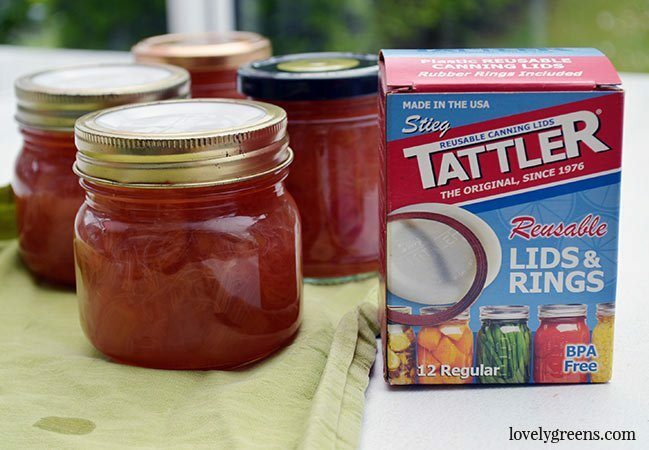 Tattler lids are reusable, dishwasher friendly, BPA-free canning lids. They’re an alternative to metal lids that are single-use and can potentially spoil food due to acid corrosion. These lids are good for YEARS meaning that you only have to re-purchase the inexpensive rubber rings. They also fit the mouths of ordinary Mason and Kilner Jars which is pretty handy. If you’re thinking about trying them out, head over here for more information and to purchase. They’re also available in the United Kingdom. 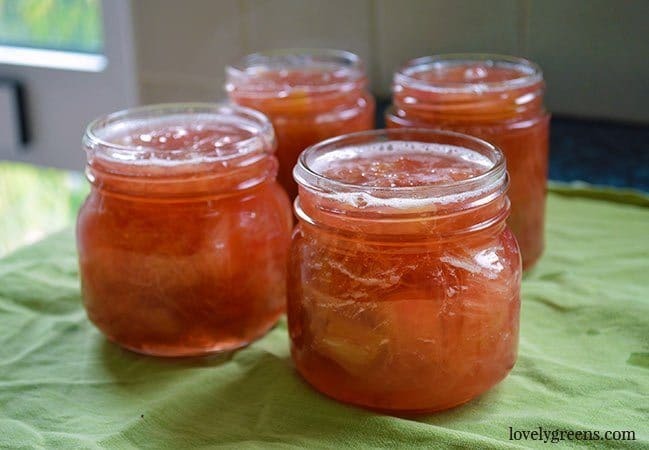 In have a lot of rhubarb that I have frozen can I do this with it. Not familiar with this sugar. Can you tell me how much regular sugar and maybe a box of pectin this recipe would call for. Use the same quantity of ordinary sugar and add Pectin as instructed on the back of the box. Looks great. You should try Marionberry or Tayberry jam.